Aim. To determine the energy profile of satellite gliocytes in the cranial cervical sympathe-tic ganglia (CCSG) in normal functioning of nicotinic cholinergic synapses (nChS) and in their pharmaceutical deprivation. Materials and Methods. Deprivation of CCSG in rabbits was implemented by using cholinolytic dimecolinum. The activity of H- and M-isoforms of lactate de-hydrogenase (LDH) was determined in gliocytes offrozen sections by integral cytophotomentry using Brumberg and Pevzner method. Results. In satellite gliocytes a considerably higher activity of M-isoforms of LDH in comparison with that of H-isoforms was found which evidences predomination of anaerobic mechanisms of energy metabolism over aerobic ones in the studied cells. The relationship between the levels of activity of (Н/М) isoforms of LDH in gliocytes with experimental deprivation of nChR exhibited a complete inversion as compared to glial cells of CCSG with normal functioning of synapses. Conclusion. Satellite gliocytes of cranial cervical sympathetic ganglion, like any other somatic cells, possess initially programmed aerobic system of energy production which transforms into anaerobic system under influence of impulses arriving through nicotine-sensitive cholinergic synapses. sympathetic ganglion, satellite gliocytes, cholinergic synapses, LDH isoenzymes, energy metabolism. In astrocyte neuroglial cells of the brain unlike in ordinary eukaryotic cells, energy is produced by strictly anaerobic mechanisms [1,2]. An aerobic abilities of astrocytes are supposed [1,3,4] to be associated with production of excess amount of lactate by these cells as an additional energy substrate to modulate the activity of excitatory ionotropic glutamate-ergic synapses which provide effective activity of the brain associated with information transmission. Taking into account the common nature of the glial cells, it may be suggested that the established peculiarities have a more generalized character and may be extrapolated to glial cells of the peripheral nervous system. In view of this, it seems important to experimentally study the energy profile of satellite gliocytes (SG) of the cranial cervical sympathetic ganglion (CCSG), where similar effective activity associated with transmission of excitation, is realized through other ionotropic excitatory synapses – nicotinic cholinergic synapses (nChS) . The objective approach to elucidation of the role of the activity of nicotinic cholinergic transmission in energy metabolism of SG consisted in use of an experimental model of partial and complete block of nChS. Aim – to determine the energy profile of satellite gliocytes in the cranial cervical sympathetic ganglia in normal functioning of nChS and in pharmacological deprivation of nChS. The experiment was carried out on 9 male rabbits of Chinchilla breed of 8 months’ age. Deprivation of synapses in CCSG was implemented by subcutaneous introduction of cholinolytic dimecolinum  at the dose of 10 and 50 mg/kg which induced partial and complete, respectively, block of synaptic transmission through nChS , with subsequent analysis of the material in the period of the maximal manifestation of the effect of the drug – in 1 hour after its introduction at each dose in complete correspondence with the pharmacodynamics earlier established for this preparation . The animals were divided into 3 groups – control group and 2 experimental groups with a partial and complete block of synapses, respectively. 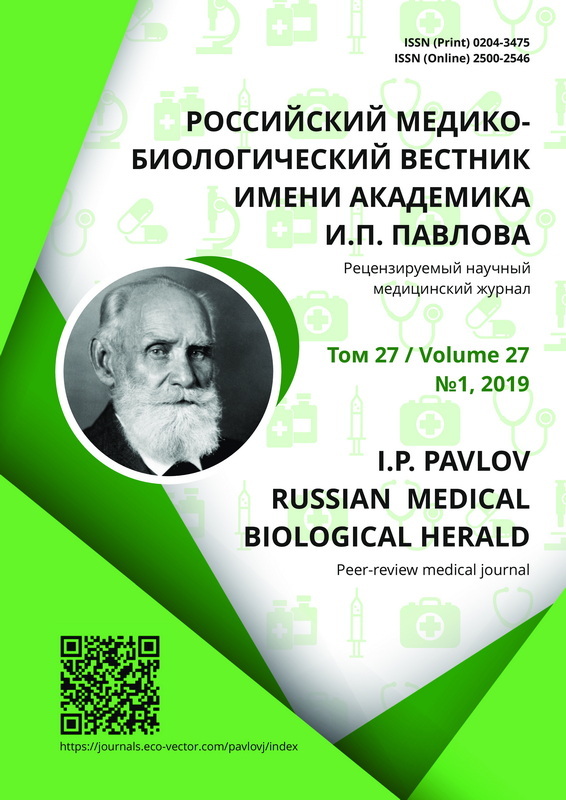 The animals were kept in a vivarium, and were looked after in compliance with the norms and rules of handling laboratory animals stated in the International Recommendations for Conduction of Medico-Biological Research with Use of Animals (1985), Rules of laboratory practice of the Russian Federation (Order of HM of RF of 19.06.2003 №267) and Cruelty to Animals Act of 01.12.1999. The experiment was conducted in compliance with the rules for work with use of experimental animals approved by Order of Health Ministry of the USSR №577 of 12.08.1977. The animals were withdrawn from the experiment by overdose of diethyl ether. Peculiarities of energy metabolism of satellite gliocytes were determined by the activity of H- and M-isoforms of lactate dehydrogenase (LDH) which are known  to modify aerobic and anaerobic, respectively, phases of energy production in cell. The activity of isoforms was determined on frozen sections separately after histochemical staining by Brumberg and Pevzner method  with subsequent quantitative measurement of optic density in relative units on МИФ-1 cytophotometer using a method of integral cytophotometry . The number of cells in the control group and in each experimental group was from 210 to 300 satellite gliocytes. The isoenzyme profile of LDH was determined by ratio of the activity of H-isoform to that of M-isoform (Н/М). Statistical processing was carried out using Statistica 7.0 program. For statistical assessment of reliability of differences and of the required sampling volume, the obtained experimental data were preliminarily analyzed for correspondence with the law of normal distribution using Student’s t-test. The differences were considered statistically significant at <0.05. In satellite gliocytes of CCSG (Table 1) a considerably higher activity of M-isoforms of LDH was found (р<0.05) as compared to the activity of H-isoforms, which evidences predomination of anaerobic mechanisms of energy metabolism over aerobic mechanisms in the studied cells, exactly like in the astro-glia of the brain [1,3]. The obtained results permit to suggest a probably universal character of anaerobic 'behavior’ of glial cells and is likely to be a phenotypic peculiarity of gliocytes non-dependent on their location in the nervous system. In experimental deprivation of satellite gliocytes of nChR (Table 1), the activity of only M-isoforms of LDH successively decreased (p<0.05) – by 43.0% in partial deprivation and by 55.0% in complete deprivation. On the contrary, the activity of H-isoforms in gliocytes did not show any statistically significant changes both in partial, and in complete deprivation of synapses of nChR (р>0.05). Because of these alterations, the relationship between the levels of activity of (Н/М) isoforms of LDH in block of synapses in satellite gliocytes exhibited a complete inversion in comparison with this parameter in glial cells of CCSG with normal functioning of synapses. In a partial deprivation this parameter already exceeds unity (Н/М=1.15) which indicates that the activities of aerobic H-isoforms and anaerobic M-isoforms of LDH become comparable (Table 1). In a complete block of cholinergic synapses the activity of H-isoforms far exceeds that of M-isoforms (Н/М=1.45) (Table 1) which, taking into account substrate specificity of H-isoforms, shows that in conditions of full deprivation of cholinergic synapses, energy in gliocytes of CCSG is predominantly produced by aerobic processes like in any other eukaryotic cell. Comparison of the results of partial and complete block of synapses demonstrates a distinct pattern of gradual replacement of anaerobic processes of energy metabolism in satellite gliocytes with the aerobic processes, as far as the number of active nChR is reduced. Thus, experimental approach used in this work highlights the fact that it is the activity of nicotinic cholinergic transmission that plays a role in transformation of energy production in satellite gliocytes towards anaerobic mechanisms, exactly like ionotropic glutamate-ergic synapses provide predomination of anaerobic mechanisms in astroglial cells [1-4]. All the said above permits to suggest a common regularity that consists in the existence of a definite relationship between a special organization of energy metabolism of gliocytes with predomination of anaerobic processes of energy production and the activity of excitatory ionotropic synapses irrespective of their localization in the nervous system. Satellite gliocytes of the cranial cervical sympathetic ganglion, like any other somatic cells, possess initially programmed aerobic system of energy production which undergoes transformation towards anaerobic processes under influence of impulses arriving through nicotine-sensitive cholinergic synapses. Bélanger M, Allaman I, Magistretti P. Brain Energy Metabolism: Focus on Astrocyte-Neuron Metabolic Cooperation. Cell Metabolism. 2011;14(6):724-38. doi: 10.1016/j.cmet.2011.08.016. Verkhratsky A, Nedergaard M, Hertz L. Why are Astrocytes Important? Neurochemistry Research. 2015; 40(2):389-401. doi: 10.1007/s11064-014-1403-2. Magistretti P.J. Neuron-glia metabolic coupling and plasticity. Journal of Experimental Biology. 2006; 209:2304-11. doi: 10.1242/jeb.02208. Pasikova NV, Mednikova YuS, Voronkov DN, et al. Glial satellites as the source of additional energy supply to the neurons during the increased frequency of firing activity. Morfologiia. 2012;141(1):33-8. (In Russ). Brovtsyna NB, Gmiro VE, Gorbunova OB, et al. Neuronal nicotinic cholinergic receptor ion channel structure features established on the basis of studying the relationship structure and activity in a series of ganglioblocker. Biochemistry (Moscow) Supple-ment. Series A: Membrane and Cell Biology. 1996;13(1):57-70. (In Russ). Pershin GI. Dimecolin. In: New Medicines. Moscow: Medicine; 1966. P. 72-100. (In Russ). Brumberg VA, Pevzner LZ. Neyrokhimiya izo-fermentov. Leningrad: Nauka; 1975. (In Russ). Agroskin LS, Papayan GV. Tsitofotometriya. Leningrad: Nauka; 1977. (In Russ). Copyright (c) 2019 Gorelikov P.L.